If you are looking for information on the SYNLawn franchise business opportunity, SYNLawn franchises or SYNLawn franchising, then you have come to the right place. There has never been a better time to be a part of the growing artificial grass market. Artificial grass has become widely accepted as a viable alternative to natural grass for use in residential landscapes, roof top gardens, pool surrounds, commercial common areas, children's play areas, dog play areas, as well as, golf putting greens and practice areas. SYNLawn® has emerged as a recognized brand in the artificial grass market built from over 40 years of artificial turf manufacturing experience. Owning a SYNLawn® franchise is your opportunity to directly benefit from our experience since the inception artifical landscape grass industry. The family-owned SYNLawn® brand has a solid reputation which stands for innovative products, world-class installation standards and customer service excellence. As a start-up franchise you will operate your own SYNLawn® branded location complete with a full build out of our exclusive modular designed showroom. If you already have an established business in landscaping, contracting or other complementary home amenity, then the add-on franchise may be better suited. With an add-on franchise you will enhance your existing business by adding a new dimension to your product mix for your current customer base. The extensive line of SYNLawn® brand products are all designed for varying applications utilizing our proprietary installation systems. With these systems you will customize and design each of your customer's projects for landscape, pet, golf and playground applications. 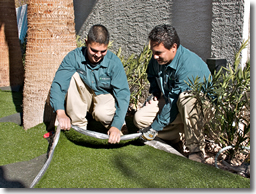 As a new franchise owner you will receive extensive training in all facets of the artificial grass landscape business. You will get 4 weeks of training for everything including sales, marketing, day-to-day operations, management and installation. Each franchise location will have certified trained professionals in all installation systems. Your staff will be trained and certified for each installation method including landscape, playground, dog and pet, and golf applications. 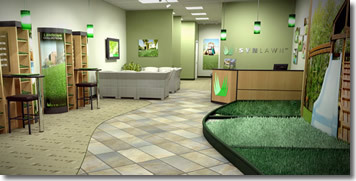 Manage your SYNLawn® franchise with SYNOffice™, our proprietary online software application for managing sales leads, project details, installation scheduling, inventory control, and ordering products and supplies. Learn from our years in the industry with our operations manual. This extensive reference manual contains detailed information on our policies, procedures, roles and responsibilities, and everything you need to know to start out in your new business. As a franchise owner you will get access to our exclusive brand logos and professionally-produced advertising material for marketing in your area. In addition, you'll be listed on our website for reaching customers searching for SYNLawn® in your area and generating leads. We will work with you to define your area of responsibility and provide possible site selections based on ideal demographic information. 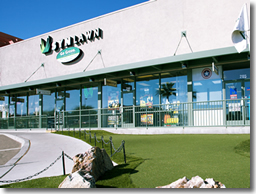 The build out of your SYNLawn® franchise location will be completed quickly using our modular store design consisting of product displays, installation systems displays, a cash wrap, and a customer meeting area.